Want to win a bag of Dunlop’s new LX-360 Fibre Leveller for levelling uneven floors? 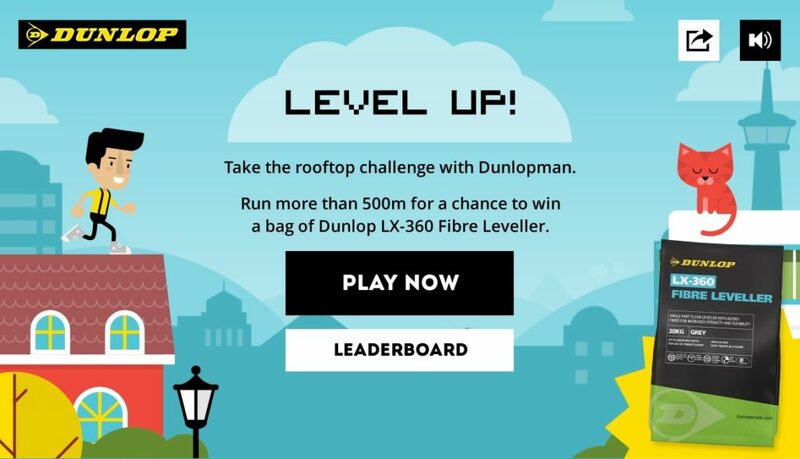 Well now you can with “Level Up” – the new online game at www.dunloptrade.com/levelup ! The aim of the game is to make Dunlopman run further than 500m by jumping from rooftop to rooftop and dodging the obstacles. At the end of the month, those on the leaderboard will be entered into a random draw with the chance of winning a bag of LX-360 Fibre Leveller*. Dunlop LX-360 Fibre Leveller is part of a new game-changing range of floor levelling compounds recently launched to provide tradesmen and women with easy with a straightforward choice of levellers for any installation. Fibre-reinforced for increased strength and added flexibility, LX-360 is an all-around leveller and can be laid from 3mm up to 60mm bed depth. Thanks to its innovative formulation, it can be used over timber floors and underfloor heating, creating the perfect flat and level surface for tiles or soft coverings. Accepting foot traffic in only three hours (tile in four hours), LX-360 is protein free and available in 20kg packaging. Self-smoothing with easy flow, it has self-healing properties for easier flooring.